I’m only posting this so I can use that title. R-Money being who he is, the reason he gave for the urgency in stopping Trump was not for The Donald’s sin of describing Republican views and gut-feelings accurately, but because it would ensure a Clinton presidency — and that family is, of course, simply too gauche, too nouveau for true representatives of better-established dishonest money to accept. But thanks anyway, [former] Governor! Plenty of good stuff there for ads in the fall. Or, as the man said: please proceed. Image: James Ward, Ferrets, undated, before 1860. It would be a major mistake to put American troops in Syria. No one in the region wants us invading yet another country. None of our allies want our strength diverted from Iran. There is no practical mission American forces could accomplish without a very large commitment. But still, I’m not going to give Gingrich any props for this one moment of clarity. The problem with Newt is not that he is incapable of clear thought at times, but that he chooses to relinquish that capacity when it’s convenient. At a Republican presidential debate last year in Arizona, the former House speaker mocked President Barack Obama for not doing more in Syria. As discussed yesterday, we live in a country where 3 out of ten Americans, and 44% of the GOP expect armed rebellion in the next few years. This is not a view compatible with democratic process. The destruction of the American polity is not a both-sides-do-it phenomenon. It is a hail mary act of intimidation, and perhaps outright violence to come, by a failed political party, one whose hopes of gaining legitimate power shrink with every passing year of demographic change. Hmmm. A reckless, failing political movement threatening violence unless its minority hold on power persists. When before now have we seen that in American history? In the primary, we learned it was difficult to be working from Boston and really affect voter turnout in the states. It was disappointing to receive data later and realize if we had access to that data earlier, we could have done something differently and affected the outcome. We have tweaked and improved Project ORCA throughout primary, so going into the general, we had several ideas and more time to incorporate those ideas into a system that would work nationally. By contrast, as the Michael Scherer’s piece I quoted yesterday describes, the Democratic cyber-team spent 18 months just to build the essential infrastructure of a usable meta-database and developing the software tools that would allow the Obama team to exploit that information for use in different settings throughout the active campaigning season. Another truly important change was in the technology itself. “Cloud computing barely existed in 2008,” Mr. Slaby said. Using mainly open-source software and the Amazon service, the Obama campaign could inexpensively write and tailor its own programs instead of using off-the-shelf commercial software. To build Orca, the Romney campaign turned to Microsoft and an unnamed application consulting firm..
[But there were] a series of deployment blunders and network and system failures. While the system was stress-tested using automated testing tools, users received little or no advance training on the system. Crucially, there was no dry run to test how Orca would perform over the public Internet. Open source. Build it yourself. Don’t had over your wallet to a consultant and take (allegedly) turnkey delivery days or weeks before chequered flag goes down. Lots of folks here have more experience with this kind of work than I ever will, but my friends in the open source camp always emphasize: if you build the tool and know the tool, and do so in an environoment that’s easy for others to inspect, critique, and improve, you get good software. You certainly can get fine software from conventional proprietary approaches — but not always, and you suffer most when you have a glitch: fewer people know what’s going on, and the code itself can be much more opaque. Commenters here can flesh that cartoon out with much more bitter experience, I’m sure — but I think we all know the eternal truth that you really, really don’t want to be testing critical new components on the night. A last point: One of the benefits of demanding extreme effort in our Presidential campaigns is so that they can serve as stress tests, a way to see how well each side handles pressure and complex tasks. And here, you can see a lot in the different approaches the two teams took to building technology intended to address essentially the same problem. You get a sense of their respective management cultures, their analytical skills, their capacity to master their emotions and organize themselves against the specific tasks they face. Whom would you count on to organize anything, Mitt Romney or David Axelrod? 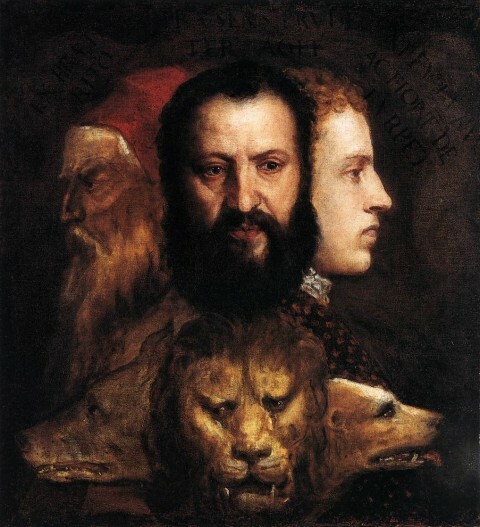 Image: Titian, Allegory of Time Governed By Prudence, c. 1565. President Obama … He abandoned our friends in Poland by walking away from our missile defense commitments, but is eager to give Russia’s President Putin the flexibility he desires, after the election. Under my administration, our friends will see more loyalty, and Mr. Putin will see a little less flexibility and more backbone. “I’ll respond to a couple of things that you mentioned. First of all, Russia I indicated is a geopolitical foe. Not … Excuse me. It’s a geopolitical foe, and I said in the same — in the same paragraph I said, and Iran is the greatest national security threat we face. Russia does continue to battle us in the U.N. time and time again. I have clear eyes on this. I’m not going to wear rose-colored glasses when it comes to Russia, or Mr. Putin. And I’m certainly not going to say to him, I’ll give you more flexibility after the election. …While in Moscow, Mr. Romney told a Russian known to be able to deliver messages to Mr. Putin that despite the campaign rhetoric, his father wants good relations if he becomes president, according to a person informed about the conversation. The rest of this post, I think, writes itself. 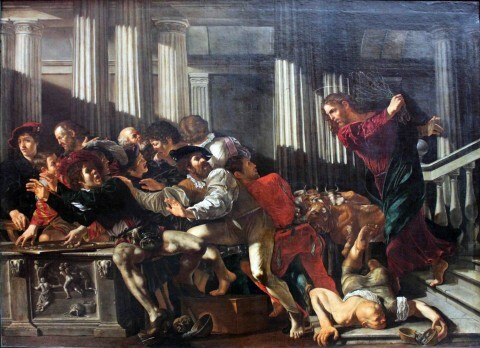 Caravaggio, Christ Expels the Money Changers from the Temple, 1610. Dessert Topping or Floor Wax? When Romney talked about killing FEMA it wasn’t because he really thought the states could or should do it, nor did he think the private sector could or should. When Romney went after FEMA in the primary debates, it was all about letting GOP voters know that he sees the Black Helicopters too. That’s plausible, certainly, and I’ve no doubt that when you’re betting on Romney’s combination of cynicism and opportunism, you’ll never lose taking the over. But at the same time, I think this particular stance was overdetermined — and that it’s worse, not better, that Romney’s views on federal involvement in any social good derive even in part from remnants of genuine belief. Here I have just a hint of (one remove) personal insight to share. Y’all recall that among the Romney “home states,” Mitt and his family did in fact live in Massachusetts for a lot of years. Which means he had friends here, people who knew and liked him before ambition consumed his soul. As it happened, I had dinner with a couple of those folks last week — people who had met him in the context of (non-sectarian) social action and who had become personal friends over the years the they knew each other, beginning well before Romney embarked on his political career. My friends barely recognizes their friend any more, which saddens them, but in talking about Mitt’s charitable interests, our dinner companions emphasized two things: the first is that Romney does recognize that there are people in need, those for whom a helping hand is both needed and likely to be effective. The second: Romney possessed then, and presumably does now, an enduring commitment to the Mormon church — not just to the formal tenets of the faith, but to the institution as it saw itself, a kind of corporate entity integrated into all facets of its members’ lives. That’s the context in which Mitt had no problem with the idea of a group responsibility to ensure individuals’ well-being-in-extremis. But such social service properly takes place (in my understanding of my friend’s gloss on Mitt’s views) within the private sphere, in the settings that Mormons or others find themselves. The idea of state intervention was not just unnecessary; it was an unwarranted intrusion. The virtue of such an approach is obvious, I think: within specific communities, there are real, kept, mutual guarantees. Its defects are equally plain: for one, the price you pay for such common cause is that the gentile — and we’re all gentiles to somebody — is not part of the deal; and for another, there’s the problem of scale. In a country of 310 million-plus folks of all kinds of origins and destinations, the moral and practical implications of that kind of approach are catastrophic. As Sandy illustrates with brutal clarity, if your approach to the problems of society within the nation we actually inhabit is a canned goods drive…well, were he actually in charge, the consequences that would flow from what at least were once Romney’s beliefs would be pretty certainly disastrous. And hence the real problem, IMHO. Throughout this election season, plenty of folks who should know better have floated the notion that the GOP candidate seen on the stump is a fake Mitt — thus enabling the fantasy of some pragmatic, moderate Mitt who would both seek and be able to govern from the sensible center. I think that’s pretty certainly hogwash on the face of it; the running mate choice, if nothing else, is the one actual Presidential decision a nominee gets to make before the election, and I think Mitt’s shows the direction of a putative Romney presidency pretty clearly. But even if there still survives some real Mitt behind the facades we’ve seen to date, here’s the rub: to the extent that the archaeology of friendship exposes that person, we find a man who does not accept the implications of what it means to live in a heterogeneous nation and a pluralistic society. So, that’s what you have to ask yourself: is it better if Mitt didn’t care what he said about FEMA before it became inconvenient to have uttered his wingnut-bait? Or should we prefer that he actually believed in the proposition? To me, it’s the second option that truly terrifies.YMMV. 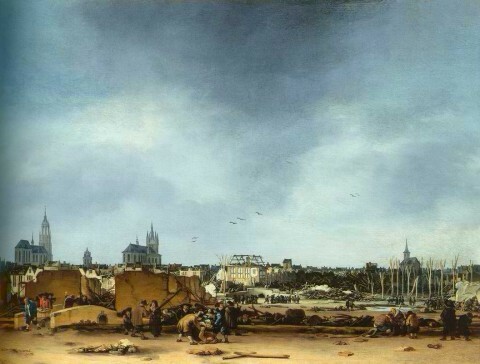 Image: Egbert van der Poel, View of Delft after the Explosion of 1654, 1654. You know you have a problem when even the first runner up in the John McCain Get Off My Lawn Steeplechase — Tommy Thompson — has a better handle on setting standards for his kids than does the Party of Family Values nominee for president, W. Mitt Romney. Bill LuMay, WPTF talk radio:What is it like for you to hear the President of the United States call your dad a liar? 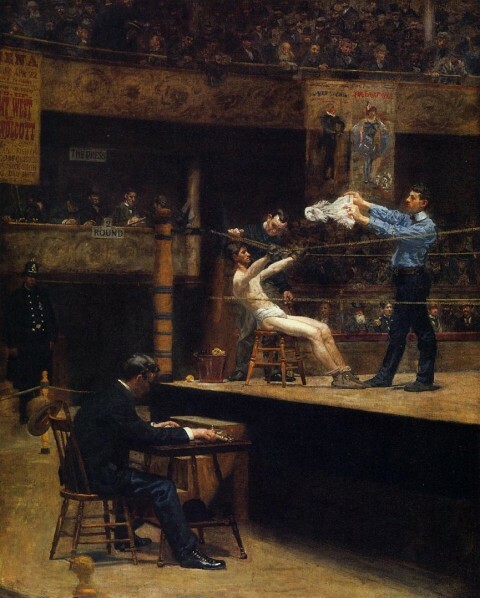 Tagg Romney: Well, you want to jump out of your seat and rush down to the debate stage and take a swing at him. Ta-Nehisi Coates, who has been killing it on his blog lately, nails the brute fact that lies behind Tagg’s stated desire to beat down that African-American guy who had the temerity to speak to his father without the requisite deference. It’s worth trying to imagine any black man associated with a credible black candidate for the presidency, joking about beating down the incumbent president of the United States. Racism isn’t just in what you do and don’t say, but in the terrain you walk. It is baked in the cake — a fact which is hard to understand when you are the party of white people. To point out the obvious, the phrase “black man” was not accidental. In America black men, specifically, enjoy the stereotype of being hyper-violent — one which regrettably spans the political spectrum. Michelle Obama is many things. “Black man” is not one of them. Obviously (at least I hope so) I’m with Ta-Nehisi here. Tagg’s bluster comes directly out of that haze of untouchability and unchecked agency that is the point of secure privilege. Only those with unencumbered access to power get to say stuff like that — and the “boys will be boys” line of those making excuses for the insufferable Tagg is exactly the form in which privilege maintains the world view that makes such unearned goods available to those on top. One can’t imagine a black man getting away with bragging about wanting to strike a white president because to do so violates all we know in our bones about the way power and authority is divided in this society…which, of course, is exactly what makes Obama so important, and so threatening to those for whom the end of the assumption of white privilege is unacceptable. There’s more than just race at play, to be sure. Class is a big thing here, at least as I see it. As I say below, we’ve all encountered a Tagg — all noise and fury after it’s wholly safe to bluster. But there’s more than just barroom courage here (or, in deference to Tagg’s beliefs, I guess I should say soda-fountain fortitude). Tagg Romney has never had to face a moment of material uncertainty — much less want — in his life. He spent his life in the company of those similarly fortunate, or those who defer to his material and status advantages. He gets to think that whacking someone — anyone, not just the President — is perfectly routine reaction to his frustration because no one in his charmed circle has ever dared to school the young prince. You don’t get this kind of nonsense unless the speaker is at some critical emotional level unaware of the meaning his words — and such obliviousness is born of the bubble in which class advantage secures and imprisons you. And that’s where the Romney parents’ failure comes in. I known some seriously wealthy people, and count as good friends some of their number. I know their kids. I’ve seen what you do when you want them to grow up right. The essence of the lesson: manners. Regard for others; awareness of the debt of gratitude and obligation of respect due to those whom you encounter along the way; acceptance of the duty of courtesy you owe both strangers and your own — hell, just remembering to say thank you for the most anonymous of services, the busser filling your water glass or whatever. 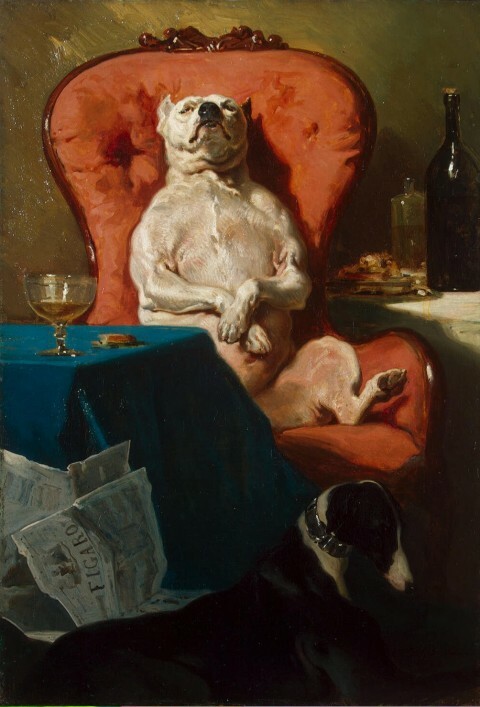 The purpose is not simply to reward a favor done, nor to recognize some stranger momentarily encountered, nor even to inculcate an awareness of the degree to which you depend on, say, those who clothe you and feed you and keep you warm (though all of these are damned important). Tagg somehow missed that lesson. The words are his, and he owns whatever scorn and disgust he earns with them. But Tommy Thompson understood at least this much: that it was his job to say both that his son’s words were not acceptable: not as public discourse, and — crucially — not as part of his own family culture. Mitt’s reaction to Tagg’s tantrum? I’ll leave it to others to decide what this tells us about a man who would be president. And then his makes his strain and his face twists. He shouts something and his buddies tug a little on him. He shrugs, as if breaking a way — but not too hard; never too hard. And then he lets himself be led away, telling anyone in earshot how that other fellow was lucky, lucky, that the gang wouldn’t let him get into it. Tagg’s a punk, and all I can think when I look at his image is how much I’d like to take his lunch money. 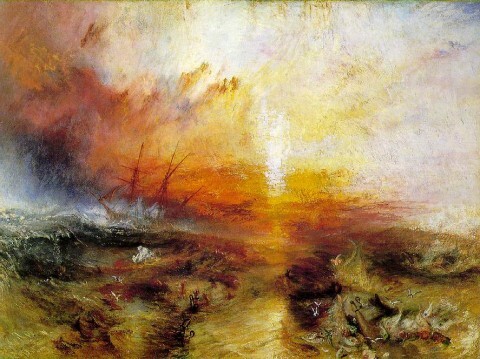 J. W. M. Turner, The Slave Ship, 1840. 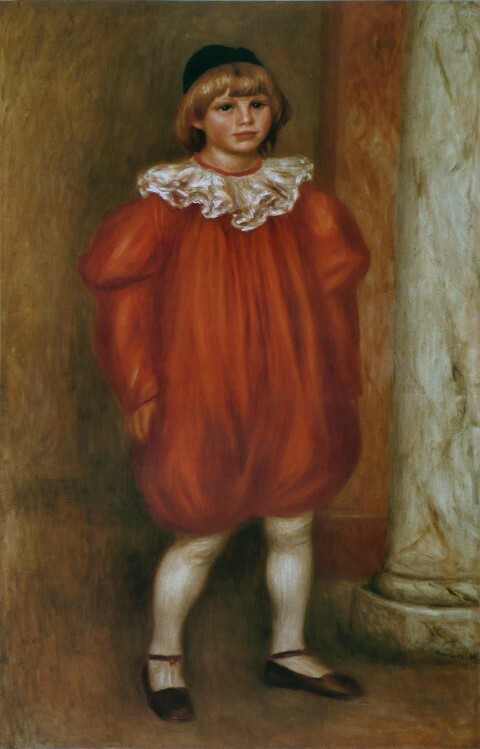 I think I’ve used this painting before, but hell — it’s a truly great work of art, and I believe it’s important to remember as best we can the sustained, lethal violence at the heart of the history of race in America. Turner’s picture does that better than any words of mine could. So you get to look at it again.